All to say is that probably someone on the Titanic should have packed some HCB’s in their trunk, and it is a relief to know that if you’re going to hang these buns if your kitchen, it’s a once a year event kind of like cleaning the crumbs out of the little toaster tray I always forget is there (maybe that explains the fires?). 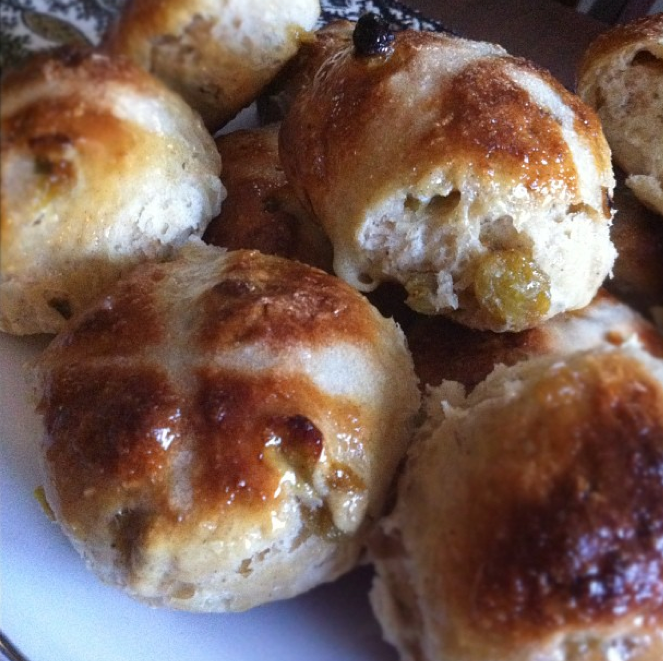 I haven’t even eaten many hot-cross buns in my time but seeing them in the bakeries made me crave them. 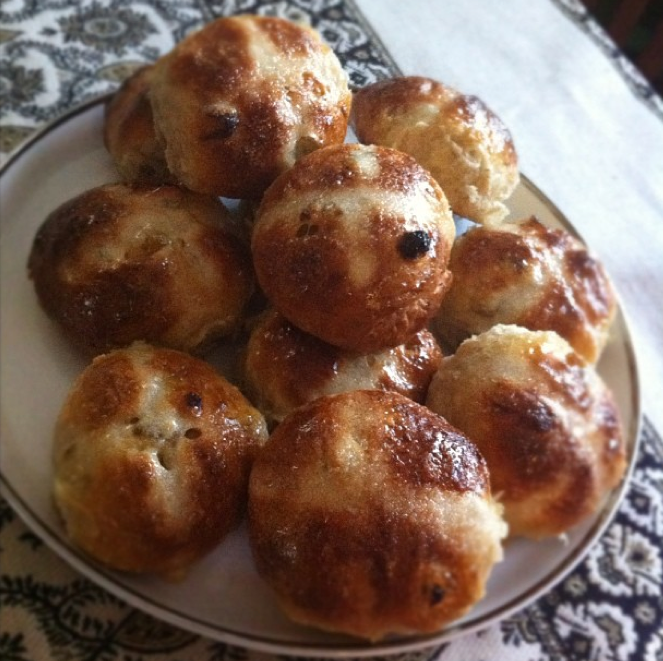 They’re slightly sweet, yeast-leavened buns which have raisins or dried fruit in them and are scented with spices like cloves and cinnamon. And since I knew nothing from a HCB, I turned to Nigella and her recipe. 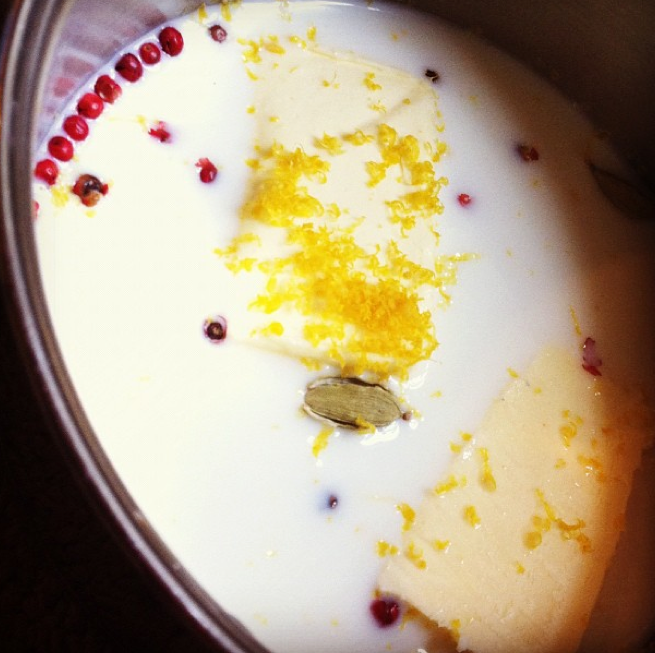 Start by infusing 150ml of milk with the zest of an orange, 1 clove and 2 cardamom pods. Add 50g butter and heat on medium-low until the butter melts and then pull the pot off the stove and set aside. Now measure 400g bread flour, 1 pack (8g) active dry yeast and 125g mixed dried fruit (I only had raisins) into a bowl. Add 1 tsp ground cinnamon, 1/2 tsp ground nutmeg and 1/4 tsp ground ginger. Whisk together. (I had some medium shredded unsweetened coconut on hand so added only 110g raisins and 20g coconut. To be honest I couldn’t taste it in the final bun). 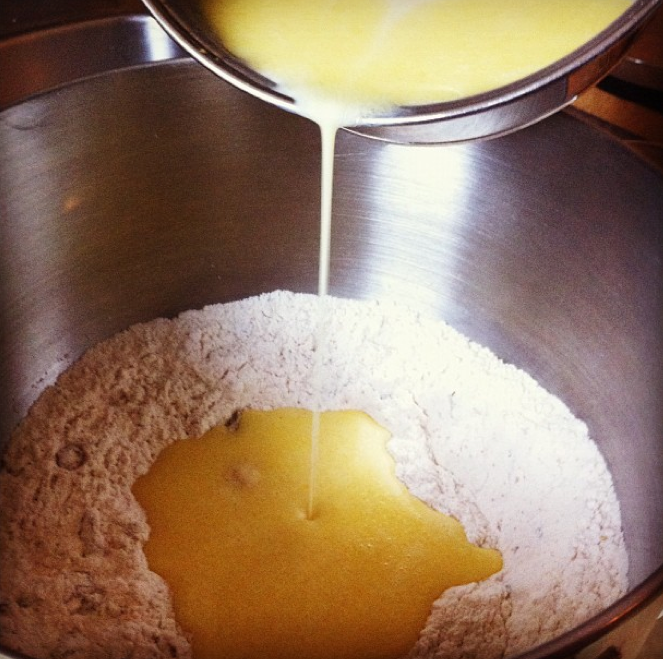 Pour the milk/egg mixture into the flour and I mixed it in a stand mixer using the bread hook until it was shiny and smooth. 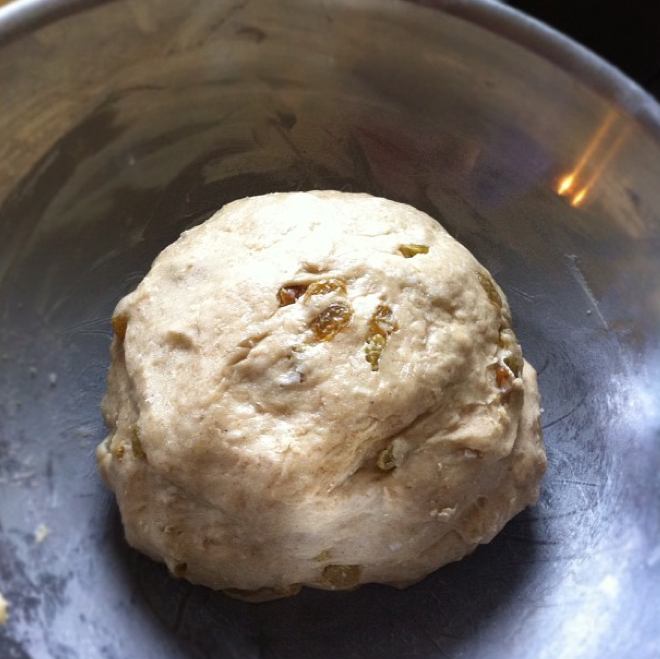 I did find the dough dry and probably added 1/8 cup extra milk when it started combining and needed more moisture. (You can just add water as well). Pop this baby into a buttered bowl and seal well with saran-wrap. Do not leave a gap or it will dry out (it happened to me, grrr). Now it goes into your fridge overnight. 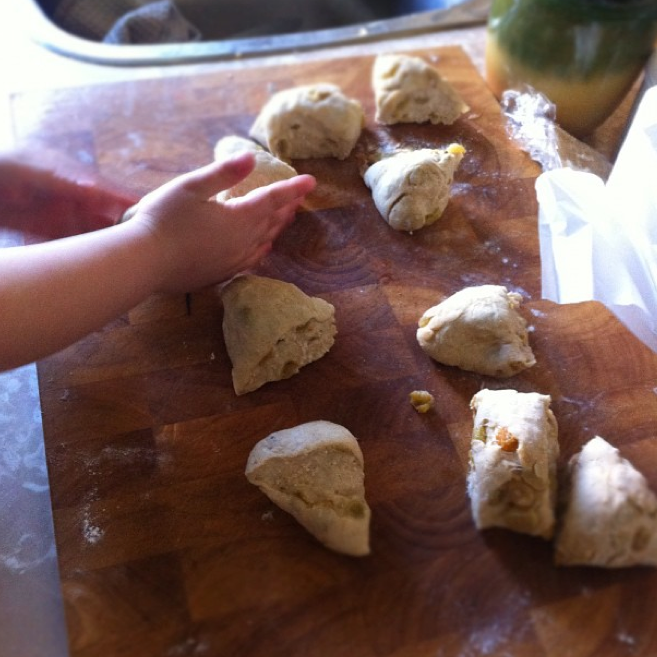 Then cut up the dough into 12-16 buns (Nigella likes them smaller, I went bigger). Just cut the dough in half and then half again ect, until you have enough pieces approximately the same size. 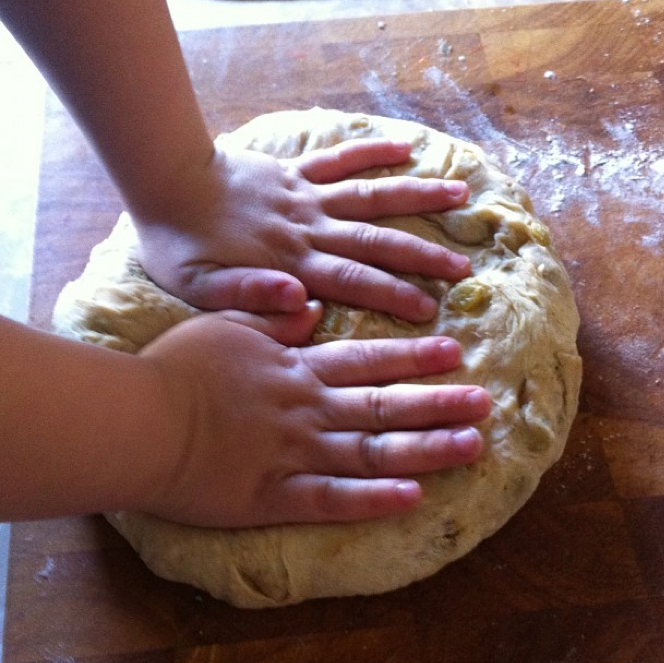 Now roll them into smooth, round buns. 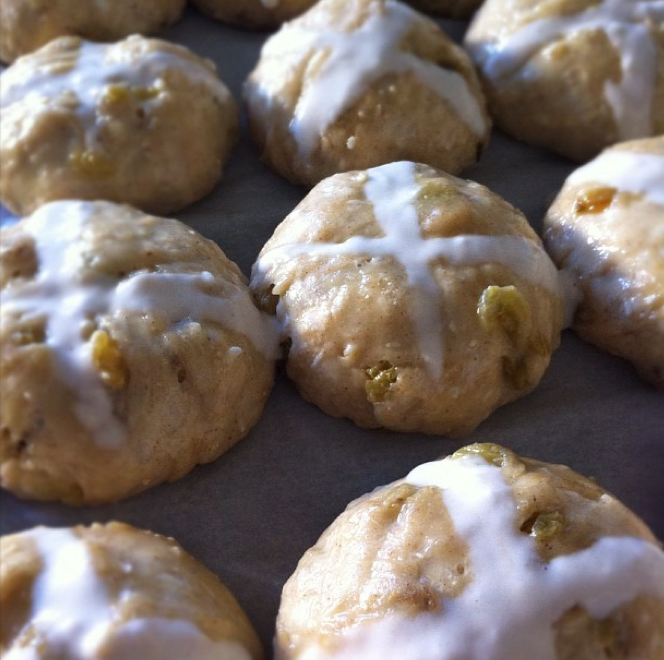 Put the buns on your parchment-lined cookie sheet and score them with the “cross” using a table knife. Nigella suggests using the dull side, but even with the cutting edge I could barely make the cross visible. You want the buns quite close together on the sheet, almost touching but not quite. PREHEAT THE OVEN TO 425°F (220°C). Throw a clean tea towel over them and let them rise on top of the stove for about 45 min-1 hr. While these are rising you can prepare an egg wash (just beat 1 egg with a little milk) and your “cross”mixture which is 3 tbsp AP flour, 1/2 tbsp sugar and 2 tbsp water mixed til thick. 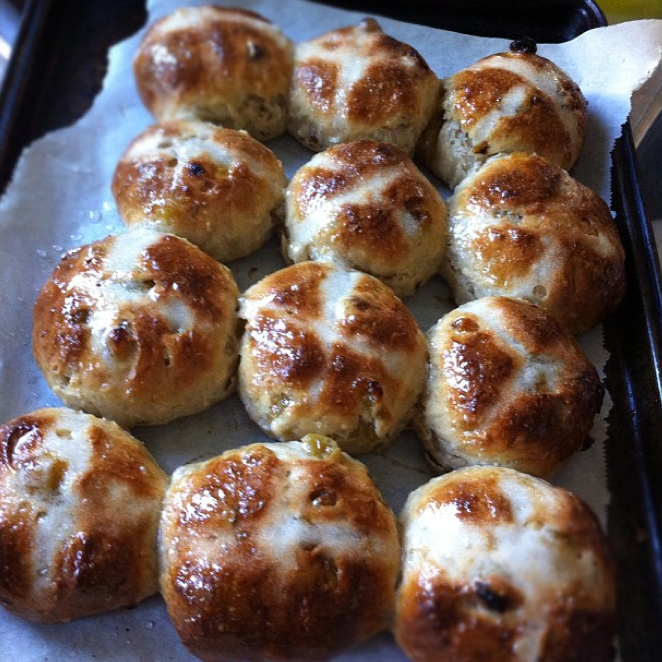 When the buns have risen, they should be touching each other, brush them with your egg wash and then use the “cross” mixture and a teaspoon to drizzle a cross shape in the scored area (if it still exists as mine had all but disappeared). POP INTO OVEN for 15-20 minutes. I left mine about 20 (I had fewer, but larger buns). 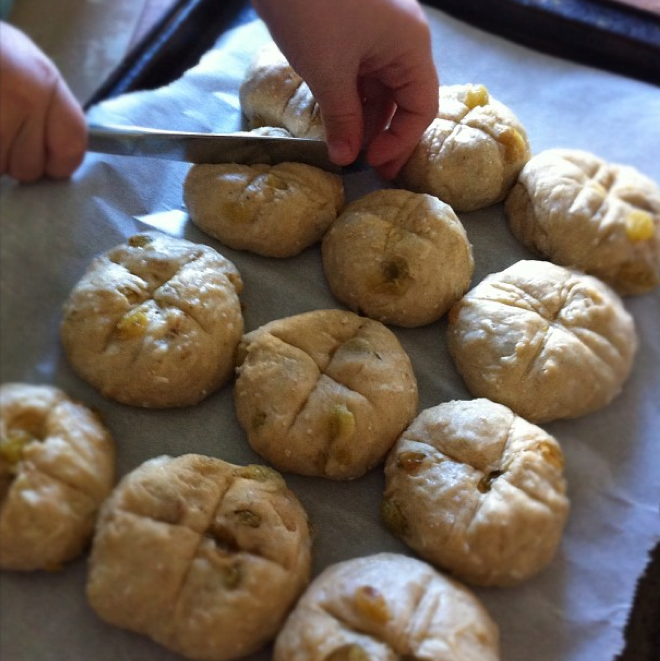 Remove from the oven and mix 1 tbsp sugar and 1 tbsp boiling water and then brush the buns to sweeten and glaze them. Let cool, then eat immediately (right after you utter your “street-cry”). I found these best when still warm, but am still happily eating them two days later and all I do is give each bun about 20 seconds in the microwave to revive it slightly and then they’re great with a cup of tea. Have Easter everyone. Have a chocolate-filled long weekend!